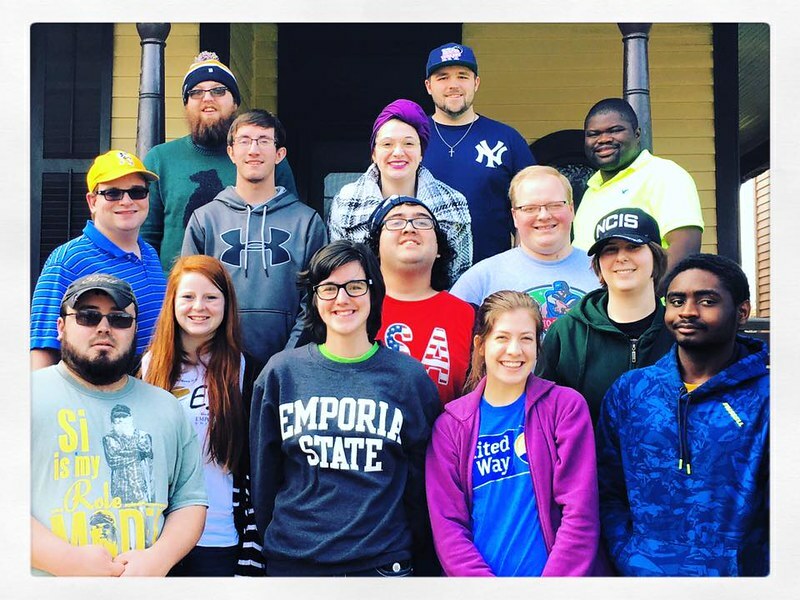 Over spring break, 14 college students traveled with United Methodist Campus Ministry at Emporia State University on the Civil Rights Odyssey study tour. Ten of the students were related to campus ministry at Emporia State University, and four of the students were related to campus ministry at Washburn University in Topeka. Students visited civil rights historic sites in Topeka, St. Louis, Atlanta, Tuskegee, Montgomery, Selma, Birmingham, Memphis and Little Rock. ESU United Methodist Campus Minister Kurt Cooper led the trip. This is the eighth such trip studying civil rights during Cooper’s tenure at ESU. He was assisted by the Rev. Wallace Smith of Journey American Baptist Church in Overland Park, Kansas. This trip was partially funded by a grant from the Peace with Justice ministries of the Great Plains Conference and by mission and ministry funds that support campus ministry throughout Kansas and Nebraska. The students on the trip were: Erynn Dahlke, Jason Kuehl, Emily Logback, Felicia Edson, Abe Ruffcorn, William Garner, Chris Williams, Spenser Johnson, Justice Brobbery, Murad Jalilov, Wesley Gately, Leo Hope, Megan Hasslinger and Micaela Morris. Some of them accepted an invitation to share their thoughts on the journey. Their remarks are published below. "The most moving experience on the trip was the visit to the Southern Poverty Law Center. It affected in a tremendous way. It opened my eyes to the struggles that many peoples face today, whether that be because of their race, gender, religion or sexuality. In the 21st century, many people still experience hatred, discrimination, violence and even death. The experience further motivated me to speak out and seek justice for those whose voices need to be amplified, and it reinvigorated my passion for social and human rights for all. "Writing this, I am reminded of a quote from the Rev. Dr. Martin Luther King Jr.: “Injustice anywhere is a threat to justice everywhere.” Those words and the experiences of the Civil Rights Odyssey have reignited a spark in me that has been waning as I go through the daily motions of life. "I am committed to fanning that spark to ensure that it becomes a flame that will give me courage to use my voice to fight for justice and peace." "Most impactful for me was to see the involvement people my (our) age had in the movement. It was encouraging to know that whatever age you are there is a chance for you to make a difference in the world. I felt that it was something the church really embraced at that time and empowered younger generations to be a part of the movement. I would like to see that same encouragement return to our churches once again. "On the topic of churches, visiting church sites definitely was most eye-opening to me. I had no idea how large of a role churches played in the civil rights movement. But after going through the tours, I realized that the movement really stemmed a lot from church congregations rallying and peacefully fighting back. Never before have I heard of a church movement that was so influential on society. It is definitely something that stayed with me in returning home and is something that has been on my heart. How can the church once again be a powerful voice in fighting injustice in society? "Not to add fuel to an already flaming fire, but the current injustice toward our LGBTQ neighbors was something placed heavily on my heart during this trip. My theological beliefs on that matter may not lead me to the whole-hearted belief that homosexuality is “natural” or God’s intention, but during this trip, my heart was really opened toward that community. They face tremendous oppression in our society, and the church has done nothing but encourage that. I think it is definitely time for us to reimagine how we interact with that community and become more inclusive and loving toward them. "Overall, the questions that have remained with me the most when thinking about fighting injustice are “What will they lose if we do not help” instead of 'What we lose if we help.'" "The most inspiring and touching part for me was at the Southern Poverty Law Center. The fountain memorial really touched me. Biblically, when we watched the video, and it talked about there being water in it because it is healing and cleansing, I thought of my baptism and related back to the sermon that Henry Whiner gave at our weekly worship service, Relevant. The 40 individuals in the fountain all sacrificed much for the civil rights movement but were common people. "